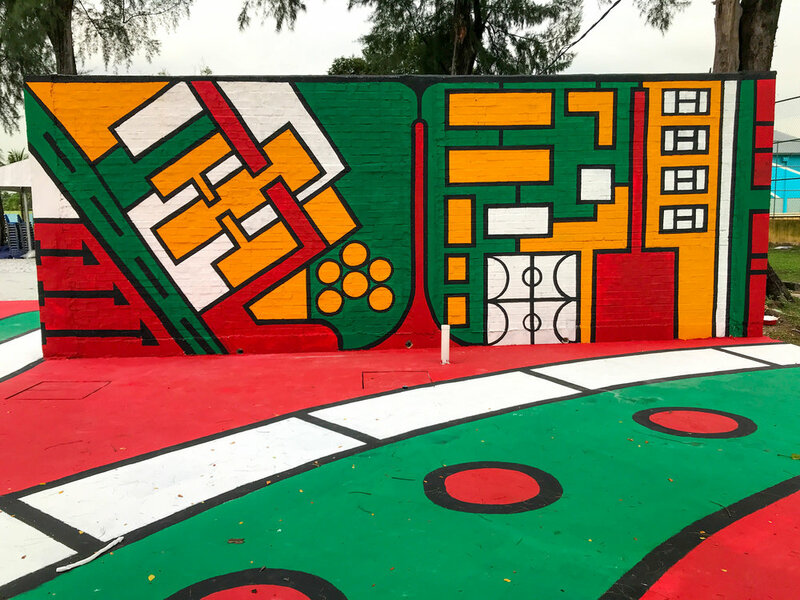 Located in vibrant Kelana Jaya, the multicoloured PJKITA mural begins from the main entrance of PJKITA Community Centre and seamlessly flows from the wall to the floor and then spills out across the street stretching 120 metres long towards Stadium MBPJ. The design of the street mural playfully mirrors fragments of the map of PJKITA’s site and surrounding neighbourhood. Patterns are expressed in bright primary colours of tectonic geometrical shapes. The PJKITA entrance marks the start of the mural painting, which then flows and splashes across the main street to invite, entice and bind surrounding community and its neighbourhood to the community centre. The front view of the wall mural layout shows a diagrammatic directory map of the PJKITA Community Centre. The other side of the wall mural on the other hand, is dedicated to the different parties involved in making this community project successful, namely MBPJ, PJKITA, DTLM Architect, EPIC Communities, Nippon, Sunway construction, Lafarge, Brickdotcom, Binaform, SQ engineering and fellow community volunteers. The graphic composition of the ‘behind the scene wall’ carries similar configuration to the street mural with its white, yellow, red and green coloured shapes. Contributors, volunteers and supporters leaves imprints of their hand on dedicated spaces on the wall mural, as a mark of their contribution to PJKITA.